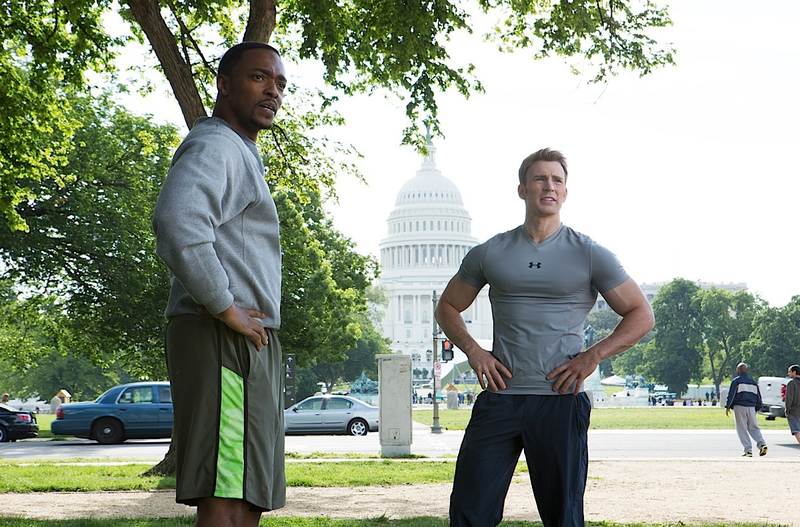 Anthony Mackie’s aerial hero Sam Wilson clarifies his role in combat: “I’m more of a soldier than a spy.” It’s a statement that undoubtedly applies to the all guns blazing Falcon, but not one that echoes alongside Captain America: The Winter Soldier. In a bolder move than perhaps initially perceived, brothers Anthony and Joe Russo decide to direct this latest Marvel instalment down a noticeably unrecognisable runway, one without the usual witty pizazz or golden godly attire. Instead, we find ourselves immersed in a more familiar world where threats come from secretive suits and moral ambiguity challenges heat of the moment decision-making. An ever-increasing commonality on the annual cinematic calendar, superhero jaunts must beware genericism. Captain America: The Winter Soldier heeds this notion by placing storytelling on a pedestal, and the result is the genre’s best outing since The Avengers. Having traded barbershop quartets for iPhones, Steve Rogers (Chris Evans) is struggling to comprehend modern society. Shield in hand and other hand in the enemy’s face, as Captain America, Rogers is unwavering — if there’s a mission to be done, it’s his job to carry out the orders without fail. However, when the star-spangled armour is removed and his protection against life and its cynicisms subsequently foiled, Rogers finds himself at odds with not only those close to him, but also at his own inherent ideals too. With the walls of surveillance closing in and S.H.I.E.L.D. director Nick Fury’s (Samuel L. Jackson) warning to trust nobody a prominent klaxon bellowing around his mind, the bastion of righteousness must suddenly contend with another menace: the aptly named Winter Soldier (Sebastian Stan). Unlike most other Marvel epics, The Winter Soldier adheres to a distinctly retro vibe; in execution, in tone and in narrative. 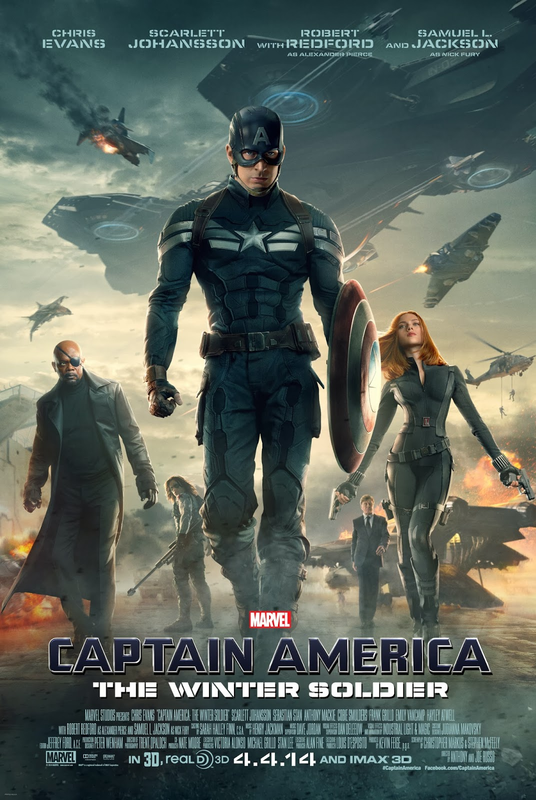 Of course the same could be said of The First Avenger but, unlike the film set amidst World War II, Captain America’s second sole venture onto the big screen sees him fiddle around in a 2014 that is rife with wisps of the past. Phrases such as “nuclear war” are tossed around and it’s not long before the technical beat of Bourne sounds off. Rather than bombastic CGI gorging, the film shuttles forth through subtle tension. It has the basis of a spy thriller, an espionage tale pitting foes against each other in a semiotic battle where the meaning behind a threat holds as much reverence as its actual implementation. The filmmakers astutely conjure up an air of uncertainty that sees hostile clouds slowly gather as a plethora of characters interact with each other. We know only to trust Cap, who is suffering the same principle-related dichotomy that any of us would succumb to if thrown in a similar situation. At heart he’s still the same scrawny chap from 1942, and is entirely relatable in that sense (his normality rather than his age). This amalgamation of Cold-War-esque strain is emphasised at no better moment than during a lift scene where, as more gun-wielding combatants enter and the number of suspects grows, one single trickle of sweat represents a hazy downpour from those aforementioned clouds of hostility. The overriding tonal shift works because it is different from what we normally see at the reels of Marvel (and normally enjoy too). In actual fact, The Winter Soldier is of similar mould to Christopher Nolan’s Dark Knight trilogy, as gritty realism effectively grounds and familiarises proceedings. In an interesting twist, though the Cold War vibe presents an encapsulating avenue into the film for viewers, said time period absolutely remains a modern one for Captain America. The unethical derivative of modernity combined with fears over infiltration acts as an almost tumultuous double whammy for Steve Rogers, who is experiencing the worst of two eras. A lot of emphasis is placed on character development which means the audience is able to develop a sincere connection towards Rogers who, in the previous film, was a bit of a one-trick pony. This time around, Captain America is the perfect foil for the narrative in question, one hoisted aloft by defection and deception. He’s the symbol of freedom and justice, but how can one be fair in a morally jarring modern society? Rogers walks through a museum, showing signs of still living in the past much like his seemingly outdated moral attitude (“It’s just not the same”). One recognisable element though, is conflict, and The Winter Soldier himself reflects the soulless nature of contemporary life. As a villain he’s solid, if not a tad uninspired, though Sebastian Stan does occasionally stimulate an aura of peril. The mind-strewn superhero himself, Chris Evans emits an authentic sense of noble disenfranchisement, but refrains from thrusting his character too far in the wrong direction. Unlike S.H.I.E.L.D., his stance is never compromised. Evans is a very watchable presence, much akin to Scarlett Johansson whose skilled spy Black Widow is a peculiarly compliant foil to Captain America. Johansson’s poise suits her ruthless agent, and here she is given a wider emotional spectrum to hit. Though originally introduced as part of the Iron Man thread, Black Widow is better suited to Captain America. Robert Redford shows up as S.H.I.E.L.D. seniority, a tangible throwback to those 1970s political war outings from which the film finds inspiration. His role not quite as physically tormenting as in All Is Lost, Redford appears to be enjoying the healthier hands-in-pockets approach here. Other noteworthy faces include Anthony Mackie, who injects humour and energy as Falcon, and Samuel L. Jackson whose Nick Fury sees more action than ever before. One or two issues do arise as the film trundles on, notably a moment of universal conformity against a particular someone displayed throughout the ranks of S.H.I.E.L.D., an instant acceptance that feels slightly inharmonious when considered in context with the cohesive events of previous Marvel films. Though The Winter Soldier upholds a down-to-earth narrative for most of its overly long runtime, the last 30 minutes do usher in a quintessentially grandiose superhero battle. Perhaps a more nuanced final act might have rocketed the film within touching distance of The Dark Knight territory in terms of quality, but the concluding action is exciting and does not overstay its welcome regardless. The anxiety-driven tone contributes to the film’s wholly apparent lack of humour, which is a slightly disappointing but likely unavoidable cost. “I thought the punishment was supposed to come after the crime,” rebuffs Captain America upon hearing about S.H.I.E.L.D.’s new anti-criminality methods. Buoyed by connotations of yesteryear, Captain America: The Winter Soldier presents a pertinent rhetoric on modern society by placing its titular hero in a moral joust of ethics that are tainted at best. Admirable, different, and admirably different. Good review. A very fun movie that seems like Marvel is incapable of not making. However, they do need to relax on their convoluted plots a whole lot. Yeah they don’t often make a film that ain’t entertaining. I actually thought the plot here was well done, though that may have something to do with me having just seen the jam-packed outing that is The Amazing Spider-Man 2! Cheers Dan. A phenomenal superhero/comic book film that transcends its genre! Excellent post :). Completely agree Joseph! A darn good’n! Thanks mate. Quite agree my friend. Excellent review. Thanks! Yeah this is definitely up there – it might actually be my third choice behind The Avengers and Iron Man.